There is no parking around the stadium so to make life easy and get an NRC Taxi to and from the match! After the game you can usually get a taxi from outside the ground by simply flagging a taxi down. The entry points to the stadium for ticket holders are colour coded – either red, green, orange, blue or purple – with each colour designating the route that needs to be taken to access the stadium. You will also have to exit the stadium by the same colour coded route. 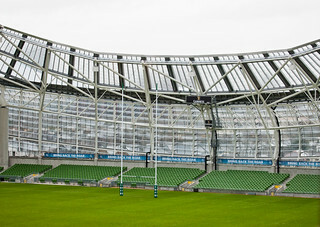 For English and French rugby fans travelling to Dublin there are usually plenty of taxis available from the forecourts directly outside Terminal 1 and Terminal 2. You should follow Taxi signage to the designated taxi ranks. A taxi dispatcher is available at either taxi rank for further assistance. Call NRC Taxis on 01 677222 to get you to the Airport whether you’re flying home or travelling to one of Ireland’s away games in Rome, Cardiff or Edinburgh. Passengers arriving by taxi will be set down on the forecourt directly outside either Terminal 1 or Terminal 2. Of course if you’re watching the match in town or anywhere else in Dublin, NRC Taxis can bring you there and back. Dublin has over 10,000 licenced taxis and many taxi ranks around the city. Enjoy your stay and remember to call NRC Taxis on 01 6772222 Dublin’s leading taxi company!